After weeks of running back and forth between the local audio shops in search of the “perfect” speakers, you finally settle on a beautifully appointed tower system that sounds every bit as good as it looks. Tight bass, rich and mellow mid-frequencies, sweet highs, and superb imaging. You make room in your living room for the behemoths, wire them into your system, kick back in your favorite recliner, and hit the play button on your remote control. And then ... Wait a minute! Where’s the tight bass? The lifelike image? These can’t be the speakers I fell in love with at Harry’s You run to the basement in a panic to check the shipping cartons—only to confirm that they are, indeed, the same speakers. 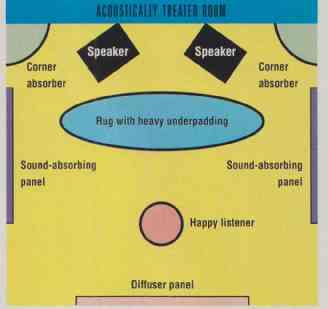 You’ve just had a crash course in room acoustics. The physical attributes of a listening room and its contents are every bit as important as the speakers themselves when it comes to sound quality—and far more important than things like fancy speaker wire, gold-plated connectors, or even the subtle differences between CD players. Simply put, room acoustics can play havoc with music reproduction Okay so your speakers don t sound quite as good at home as they did in the dealer's listening room. Or perhaps merely moving them from one room to another has made them sound, well, worse. What can you do about it? Assuming your electronics are up to snuff and your system is properly hooked up, the first step is to experiment with placement. Sometimes pulling a speaker away from a wall or out of a corner is all it takes to make a noticeable improvement in sound quality. Failing that, it becomes a matter of figuring out what it is about the listening room that is cramping the speaker system's style and taking appropriate corrective measures. ----ASC's Tower Traps (top) control bass boom and wall reflections. RPG's Abftusor (above left) uses absorption and diffusion to control wall reflections. The Diviewsor (above right), also from RPG, is a translucent panel for windows that controls glass reflections. Your listening room is the final link in a chain that extends back to the recording of a musical performance. During a recording session, the engineer places microphones in strategic locations in and around the performance area in an attempt to capture both the music and the acoustical "signature," or ambience, of the recording space. (Analog and digital processors are also used to synthesize ambience in many pop recordings.) Whether the recording is made in a large hail with a few microphones hanging above a symphony orchestra or in a high-tech recording studio with dozens of mikes feeding a forty-eight-channel mixing board, the goal is to capture 1) the direct sound from the singers and the instruments, 2) sounds that reflect off surfaces close to the performance area (early reflections), and 3) the reverberant characteristics of the recording space itself. Each of these components is an important contributor to the reality of the musical experience. The direct sound goes from the musical source straight to the microphones, bringing clarity, presence, and excitement to the recording. It also translates to the stereo image during playback, which gives the listener a sense of the relative position of each performer. Early reflections help define the spacing between instruments as well as the size of the stage area. Reverberation-diffuse sound coming from random directions as it reflects off the walls, ceiling, and floor-provides the ambience of the performance space and tells the listener whether the recording was made in an acoustically dead recording studio or a highly reverberant stone cathedral. Basically, the larger the recording space, the longer it takes for sounds to die out, hence the more spacious the recording. When you play music at home, the acoustics of your listening space are superimposed on the acoustical signature of the recording space as embodied in the recording. In a perfect world that wouldn't mess up the sound too badly. But in the real world problems are inevitable. How severe they are depends on the physical characteristics of the room. For example, when sound strikes a wall or some other boundary, it is either absorbed or reflected back into the room, or it passes through to the other side (a phenomenon called "transmission"). The degree to which sound is absorbed by the surfaces it encounters has a profound effect on sound quality, so profound an effect that acousticians as sign "absorption coefficients" to different materials: A coefficient of 1 equals complete absorption, while 0 means that all of the sound energy is reflected back into the room (no absorption). A coefficient of 0.5 indicates that half of the sound energy is absorbed and half is reflected back into the room. Rooms with relatively nonabsorbent surfaces (and low absorption coefficients) are described as acoustically "live" and are usually dominated by hard, smooth surfaces, such as painted plaster or tile walls, undraped glass windows, and hard wood or tile floors. Such spaces tend to be noisy and loud, because the sound bounces around until it finally dies out. Rooms with relatively absorbent surfaces (and high absorption coefficients) are characterized as acoustically "dead" and usually have plush carpeting, overstuffed furniture, and drape-covered windows. These spaces tend to be quiet, because sound is quickly absorbed, There are a number of steps you can take to improve the clarity and definition of your favorite music recordings- without tearing your living room apart. 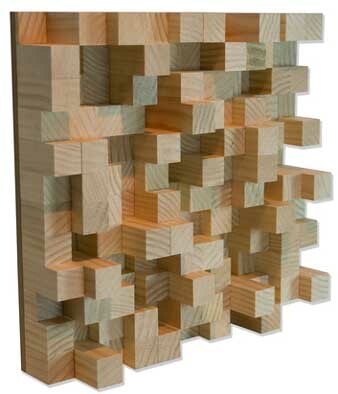 ----SDG offers a range of acoustic enhancement devices, including several wood and plastic versions of a modular diffusion panel called the Art Diffusor. The Art Diffusor Model P (in plastic) is shown painted and installed in the ceiling of a stately music room. While acousticians disagree about whether horizontal (wall) reflections enhance the spatiality of music, there is no question that floor and ceiling reflections can degrade sound quality and should be minimized where possible. Such "bounce" reflections can blur the music's clarity and imaging, making it harder to localize instruments and hear the subtleties in a recording. In general, hard reflections come across as new acoustic sources-as if additional speakers were in the room. In optical terms, the effect is like walking into a room full of mirrors-you're confronted by an array of confusing images. The most practical way to minimize floor reflections is to absorb them by putting down an area rug or installing wall to-wall carpeting. Either way, use the thickest under padding available to increase absorbency. As acoustical treatments go, this is a relatively inexpensive option. Floor reflections can be minimized further by the positioning or, in some cases, the design of the speakers. Simply elevating a speaker on a stand and angling its baffle slightly upward is one way to avoid image-muddling floor reflections. The down side is that eliminating one problem can create another. If the woofer is a few feet off the floor, for example, the indirect sound path (woofer to floor to listener) will be out of phase with the direct sound path (woofer to listener). The slight time delay can cause response dips and peaks at certain frequencies. Roy Allison, the well-known speaker designer who now heads RDL Acoustics, documented that effect years ago, and he de signed a line of speaker systems to address the problem in various ways. One model had a triangular cabinet with the woofers at the very bottom of the baffle, so close to the floor that the cancellation notch was shifted out of the operating range of the woofer. Using a subwoofer/satellite configuration with a stand alone bass module that hugs the floor is another way to alleviate the cancellation problem, although it will probably not eliminate it. Getting rid of ceiling reflections is more involved but well worth the effort for the same reasons that eliminating floor reflections is worthwhile. 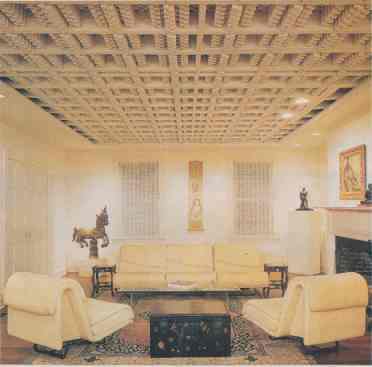 A moderate-cost option is to install the mineral fiber "acoustical" ceiling tiles sold at your local building-supply store. The problem is that they don't do a very good job of absorbing sound at frequencies much below the midrange, leaving the low frequencies uncontrolled. Besides, their industrial look doesn't quite cut it in a living room. Ceiling tiles made of fiberglass, wood stock, or foam do a better overall job of reducing ceiling reflections, and they typically have some absorption down to the midbass. Various decor-friendly fiber glass and wood-fiber panels are available from Tectum (see "Sources" at end of article). Fabric-face fiberglass tiles like Tectum Classic (about $1.15 a square foot) can be hung from a drop ceiling, but they work best when glued to 1 x 1-inch wood strips nailed directly to the ceiling. The space between the tiles and the ceiling improves low-frequency absorption. Fiberglass density should be about 3 pounds for the best results, Illbruck offers a variety of Sonex panels made from absorptive foam. Sonex 1 panels, made of white foam with very tiny pores, are aesthetically pleasing and have excellent absorptive properties. They can be glued directly to the ceiling, but you'll get better low-frequency absorption by gluing them to 1-inch wood strips nailed to the ceiling. Cost is about $5 a square foot. 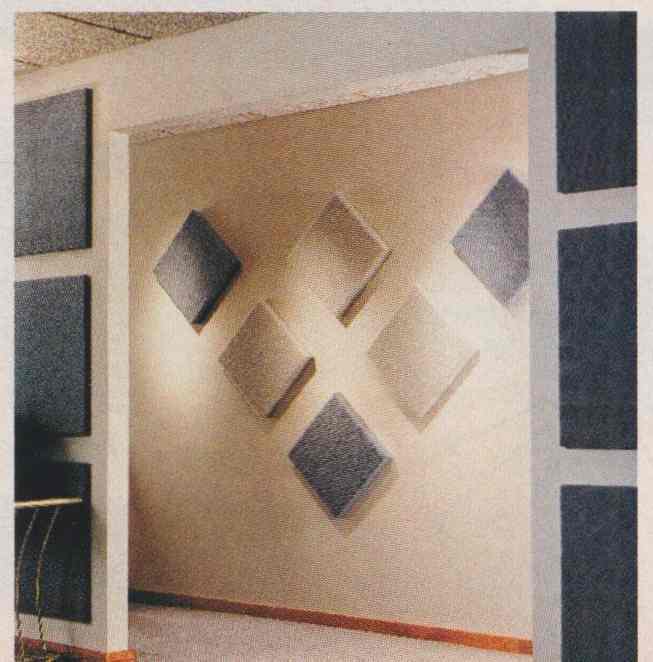 Sonex Ceiling tiles, which are designed to be hung from a 2 x 2 foot drop-ceiling grid, start at $7 a square foot. --- Designed to control wall reflections, Tectum's absorptive Fabri-Glass panels come in a variety of fabrics, colors, and sizes. Troublesome reflections can also occur laterally, depending on speaker placement and the absorbency of the walls. If the dispersion or radiation angle of your speaker system is fairly wide, for example, reflections from nearby furniture or a nearby side wall can interfere with its sound. The audible consequences are impaired imaging and unbalanced tonal qualities (the result of a ragged frequency response). That's why it's always a good idea to position speakers in front of furniture and other objects that occupy nearby locations. If the speaker must be close to a side wall, try toeing it in to the listening area (not a bad idea anyway), or hang drapes with a heavy backing on the side wall to absorb the reflections. Another option is to install fabric-covered absorptive panels, such as Fabri-Glass from Tectum (about $4 a square foot, depending on size) or Sonora (about $7 to $9, depending on thickness) from Systems Development Group (SDG). These are available in a variety of woven and non woven fabrics and many colors. If you don't mind making a high-tech design statement, Sonex and SDG also make wedge-shaped foam panels that can be glued to the walls. If the wall opposite the speakers has a hard, reflective surface, sound bouncing off that wall can create discrete echoes known as "slap-back," or "flutter-echo." Unlike reverberation, which comprises many discrete echoes and adds richness to music, flutter-echo degrades clarity and overall sound quality because individual echoes are distinguishable-and often quite distracting. --- A variety of Sonex-brand acoustic tiles made of foam and other materials is available from Ilibruck. 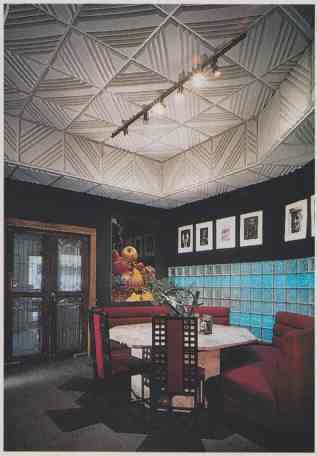 Shown in a chic restaurant setting are Sonex Panorama sculpted-foam ceiling tiles; the 2 x 2-foot tiles are also available in several other patterns. There are a few ways to fix an echo plagued listening room. First, if you have a big overstuffed couch in the room, try moving it into the area in front of the speakers. Experiment with placement to see if you can minimize the echoes or, even better, make them disappear. 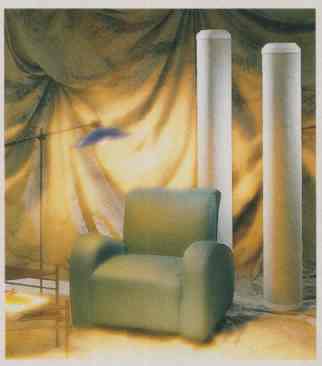 Failing that, consider hanging drapes with heavy fiberglass backing on the wall opposite the speakers (this approach can be very effective). Another solution is to install an "acoustical diffuser" on the offending wall. These unusual-looking devices, some of which resemble modern art, spread sound over a wide angle in an unfocused, random way, producing many quiet reflections instead of a few loud, discrete echoes. Diffusers are available from RPG Diffusor Systems and from SDG. 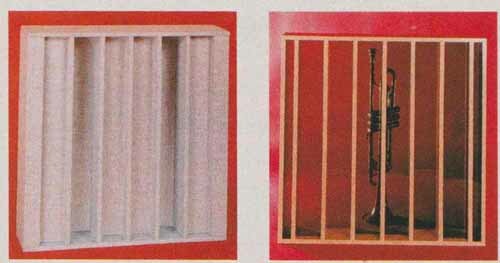 RPG manufactures a full line of diffusers, including a model designed specifically to break up flutter echo without absorption (Flutterfree, starting at about $14 a square foot) and one that combines both absorption and dif fusion characteristics (Abffusor, $390 for a 4-inch-thick, 4 x 2-foot fabric-covered unit). SDG sells the Art Diffusor, an unusual checkerboard matrix of uneven squares made out of wood or plastic (starts at $55 for a 9-inch-thick, 15 x 15-inch plastic unit). RPG's Diviewsor, for windows and skylights, has a clear or translucent back panel ($540 for a 9 1/8-inch-thick, 4 x 2-foot birch unit), but a less expensive-and less effective-way to minimize window reflections is to install wooden-slat Venetian blinds. Of course, if you find diffusers too expensive or just too dramatic a design statement for your listening room, you can always create your own simply by filling a large book case with different sizes of books. Chairs, tables, and other furniture can also make effective diffusing devices. All rooms that have parallel walls, ceilings, and floors will develop standing waves-unnatural-sounding peaks and dips in bass response caused by the interaction of sound waves as they travel back and forth between parallel surfaces. But standing waves become audibly offensive only if the frequencies at which they appear are close together, such as in a room with dimensions that are multiples of each other (for example, a room with an 8-foot ceiling, an 8-foot short wall, and a 16-foot long wall). Short of rebuilding or remodeling, you're stuck with the dimensions of your listening room, but there are things you can do to counter standing waves. One device that's popular among audiophiles and recording engineers is the Tube Trap from Acoustic Sciences Corp.--a fabric-covered column stuffed with fiberglass and "tuned" to a specific frequency range. 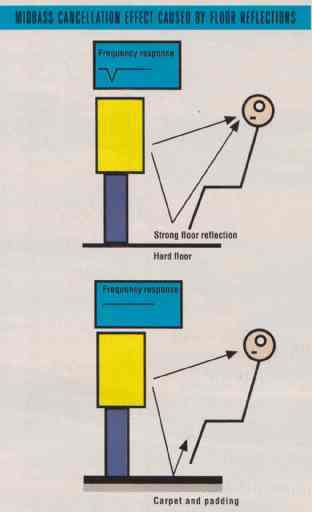 The idea is to absorb offensive low-frequency energy by placing traps around the perimeter of the listening room, especially in the corners where standing waves originate. While the Tube Trap is de signed primarily to absorb low frequencies, it also has a mid/high-frequency diffuser that you can put into action by simply rotating the tube. It can help get rid of those nasty middle- and high-frequency reflections that impair imaging and clarity. The Tube Trap is available in full-, half-, and quarter-round versions with various diameters, heights, and fabric exteriors. Prices range from $229 for a 9-inch-diameter, 3-foot-high full-round unit to $1,219 for a pair of 16- inch x 4-foot full-round units. RPG sells the Korner Killer ($745 in birch), a triangular column designed for corner placement that provides both diffusion and bass trapping (absorbing). Finally, and most important, experiment. Move your couch or bookcase, slap down a rug, hang or close some draperies, add cushions to the chairs, and try relocating or reorienting your speakers. You may not even need to consider any of the special devices we've mentioned to make your speakers sound just as good as they did down at Harry’s showroom. by Michael Kiasco -- an acoustical engineer at Menlo Scient in Berkeley, California, has had years of experience with custom installations and acoustic treatments. The following companies offer a wide variety of acoustic treatment materials and devices. Acoustic Sciences Corp. (ASC), P.O. Box 1189, Eugene, OR 97440; telephone, 503-343-9727.